Justice Neil Gorsuch, the only member of the Supreme Court who hasn’t weighed in on mandatory public employee union dues, didn’t tip his hand during oral arguments in a key case Monday. The case, Janus v. AFSCME, pits Mark Janus, an Illinois state child support specialist, who argues that forcing him to pay union dues for collective bargaining violates his First Amendment rights, against the union that represents him. Unions say that state law forces them to represent all employees, so those who don’t pay could end up as free-riders who reap benefits of union contracts but don’t have to financially support the organizations that fight for them. The other justices considered this key issue in a similar case in 2016. They didn’t issue a ruling before Justice Antonin Scalia passed away, resulting in a 4-4 tie that upheld a lower court ruling backing the mandated dues. The case has high stakes for the continued influence of state and national teachers unions — which count about a third of teachers as members — in education policy fights and Democratic politics. The overall rate of union membership nationally has declined in recent decades, though public-sector workers are still five times more likely to be union members than their private sector counterparts. On Monday, the other justices largely stuck to familiar themes, with some blunt assessments of the other side’s arguments. “You’re basically arguing, ‘Do away with unions,’” Justice Sonia Sotomayor said to the attorney representing Janus near the conclusion of the hour-long argument. Justice Anthony Kennedy, in combating Illinois’s argument that it needs an “independent” partner in contract negotiations, said it would “blink reality” to deny that unions work with governments to push a for bigger workforce and higher taxes. He also got the attorney to admit that unions would have less political influence if they could no longer collect mandatory dues from dissenting employees. Employees like Janus who don’t want to be full union members are reimbursed for unions’ lobbying and political expenses, but still must pay “fair-share” or “agency” fees that fund contract negotiations and the like. Janus says even those basic activities are political when they involve public policy and taxpayer dollars. Outside the court on an overcast Monday morning, supporters of Janus and union backers held dueling rallies. 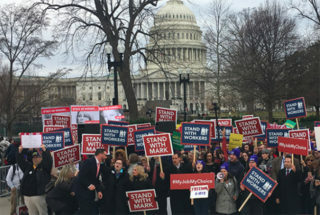 Supporters held signs that said “Stand with Mark” and “Stand with workers.” Union backers held signs that said “Unrig the system” and referenced support from conservative and libertarian donors to the law firms representing Janus and others who have brought similar cases. One sign showed Education Secretary Betsy DeVos. Observers generally believe that Gorsuch’s conservative jurisprudence indicate he’ll vote to end the mandatory dues, though attorneys for both sides told reporters afterwards that it was tough to get a read on Gorsuch’s silence. The other justices stuck to familiar arguments Monday, with conservatives honing in on the First Amendment question and liberals on the potential impact of the decision on union members and the free-rider issue. Liberal justices focused on the potential impact of overturning the mandatory dues. Justice Elena Kagan said there are 23 states, plus Washington, D.C., and Puerto Rico, which have laws that could be undone by changing the court’s precedent. Thousands of government contracts covering millions of workers would have to be rewritten at once, affecting “the livelihood of millions of individuals,” she said. William Messenger, the attorney for Janus, and Solicitor General Noel Francisco, who represented the Trump administration and backed Janus, both downplayed the potential impact on existing contracts. Clauses mandating that dissenting employees pay the “fair-share fees” can be removed without disrupting the rest of the contract, they said. Most contracts are renegotiated every few years, which means they were negotiated in the shadow of other recent cases that chipped away at those mandatory dues, and will be rewritten shortly anyway, they said. At the end of his allotted time, AFSCME attorney David Frederick was unsparing in his assessment of how ending the mandatory dues could impact daily government operations. In many contracts, agency fees are a tradeoff for a limitation on strikes, he said. “The fees are the tradeoff. Union security is the tradeoff for no strikes…You can raise an untold specter of labor unrest throughout the country,” he said. In addition to a drop in union members and resources, it is known “intangibly” that when unions lose agency fees they become “more militant, more confrontational” and look for short-term wins to make themselves more attractive to members, said David Franklin, the solicitor general of Illinois, which sided with AFSCME. Liberal justices and attorneys Franklin and Frederick also focused on the court’s doctrine of stare decisis — that is, sticking with precedent. They also argued the government should be treated in this instance as an employer, a role that would give it more rights to limit employees’ speech. Conservatives, meanwhile, focused on the relative harm of compelling speech, which is what Janus’s attorneys and backers say forcing him to pay union dues does, and barring him from speaking, as other laws limiting employees’ First Amendment rights do, like laws barring campaigning by federal workers. “When you compel somebody to speak, don’t you infringe [on] that person’s dignity and conscience in a way that you do not when you restrict what the person says?,” Justice Samuel Alito asked. A decision is expected close to the end of the court’s term in late June.